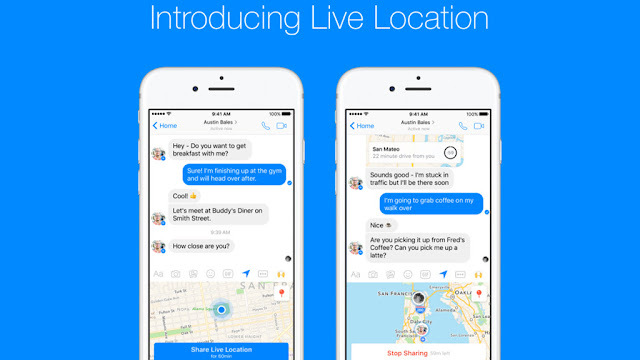 Facebook Messenger: LiveLocation locates friends in real time! In current update for the messenger donated a new feature: LiveLocation, it is said in Facebook , is an easy way to tell friends and family where you are. Sometimes the function is actually useful - for example, if you are alone on the night's way home and share the location in real time with friends or the family. With the current update, the icons above the chat input field are joined by another icon: an arrow pointing to the upper right. There you can activate the live tracking for the selected chat - whether with a person or with groups. For 60 minutes they will track your movement - even if you turn off the screen and put the smartphone in the bag. A timer shows how long the live transmission is still running - but premature termination of the function is possible. You do not award your move publicly, but only share it with the people to whom you have access to the data. The update with the live location function is now available for iOS and Android . LiveLocation, so promises Facebook, is optional and you always keep control of it. It is questionable, however, where the information of the one-hour live tracking takes place and what ultimately happens with the data. At the very least, there is so much transparency in any case, especially since even criminals can access the data - if a smartphone is connected to a public network, the caping of the device is not a thing of impossibility.